Lilies are a sign of spring or a symbol of Christmas. 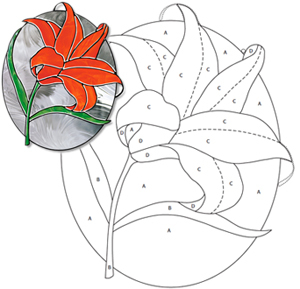 Enjoy this free pattern courtesy of our friends at Stained Glass News. Visit their website www.stainedglassnews.com for more information about their full-color, project-packed newspaper, back issues, and subscription information. Our Delphi artists suggest wispy and transparent glass for this project. See supply list below. You can also choose your own glass. We have seen mirrored glass used for stunning effects.